Picture shows (L-R): Dr Michael Penn (Macmillan Caring Locally); Kezia Needham (Meningitis Research Foundation); Georgina Smith (HCP Chairman); Matthew Smith (Make-A-Wish UK), Elle Paskins (Ella Turner Support Fund) and John Gayler (Macmillan Cancer Support) at the cheque presentation made during a Charity Players’ Snow White and the Seven Dwarfs rehearsal. 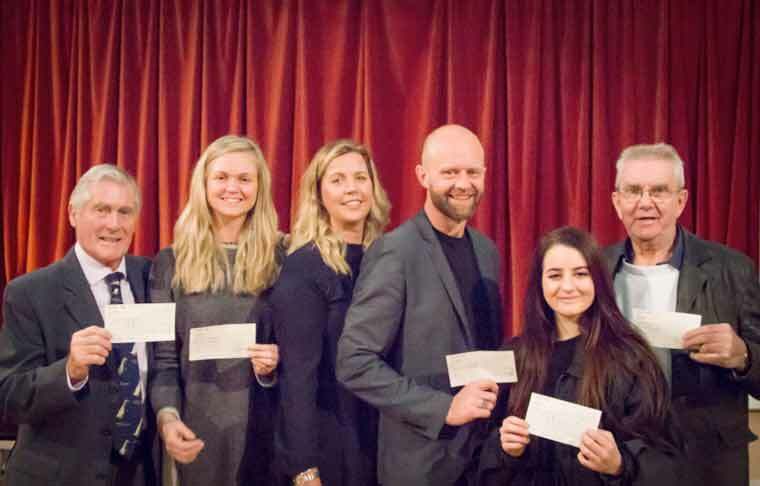 Award-winning local amateur theatre group Highcliffe Charity Players has donated £3,000 to support five worthy causes. Award-winning local amateur theatre group Highcliffe Charity Players has donated £3,000 to support five worthy causes – £1,000 to Macmillan Caring Locally, £500 to Kezia Needham who is climbing Mount Kilimanjaro in Tanzania for Meningitis Research Foundation, £500 to Elle Paskins for the Ella Turner Support Fund, £500 to support Matthew Smith’s London Marathon bid for Make-A-Wish UK and £500 to John Gayler for his forthcoming Jurassic Coast Mighty Hike in aid of Macmillan Cancer Support. HCP’s Snow White and the Seven Dwarfs runs at the Regent Centre, Christchurch, over ten performances from 21 to 28 January 2017 and as usual, all profits from the panto will be donated to local and national causes. In their 46-year history, the Players have donated more than £100,000 to charity.